Fortress Aleppo or Aleppo Citadel in Syria is considered by many to be one of the oldest forts in this part of the country. 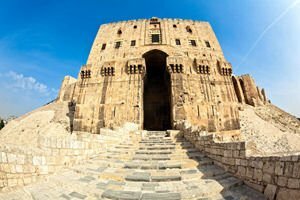 The massive and impressive citadel is situated in the Syrian city that is located in the northwest of the country. Aleppo is a medieval fortress that dominates from its hill overlooking the old town of Aleppo. Some experts even believe that the fortress of Aleppo in addition to being one of the largest is also one of the oldest in the world. Aleppo Citadel in its rich history is marked by cultural significance of many civilizations, including the Greeks, Byzantines, Ayyubids and the Mamluks. It is assumed that the citadel in the form that has remained until today is the result of a construction during the Ayyubid era. Despite numerous hypotheses for the millennial development of the hill of Aleppo, the earliest date is evidenced from 10th century when the fortress on this hill was built by the Neo Hittites). After the decline of the Neo-Hittites the state was centered in Aleppo, in the region dominated by the Assyrians, about 4th-8th century BC, followed by the Neo-Babylonians and Persians - between 539-333 years. At the time of Alexander the Great, the city and citadel was known as Beroia. Many Arab historians believe that Aleppo began to function as a citadel during the Nikator period. Within the region of Aleppo were found up to two meters of remains of the Hellenistic building. From west the Aleppo Citadel reaches an ancient road that was once covered by a colonnade, and the area of today's market in Aleppo has retained one of its urban plan of the streets. Aleppo became a veritable citadel during the reign of Ghazi, who was the son of the ruler Saladin. Both had used the castle as their residence, while Aleppo had a primary role to protect the region from the Mongol invasions in 1269 and 1400. Today, restoration work and archaeological excavations are still seething in the castle itself and Aleppo. In the citadel you can see the well preserved throne room and relics of an ancient bath. There, amidst the ruins of various archaeological periods is located the Mosque of Ibrahim which is very beautiful. Tourists of the Aleppo Citadel can see relatively well the preserved amphitheater.